"I wonder what that means?!" And this is one of the many things I love about being Catholic - it doesn't matter how many years I've done this thing, there are still always new and fascinating tidbits to learn! So, Spy Wednesday. The explanation was simpler than I anticipated, but no less profound. 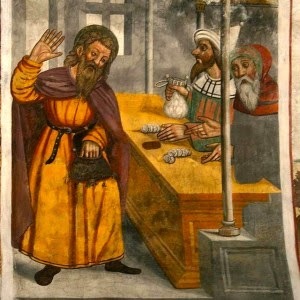 As this is the day prior to Holy Thursday, it is the occasion on which we remember how Judas Iscariot betrayed Jesus by going to the high priest and negotiating information in exchange for 30 pieces of silver. The Synoptic Gospels record this scene in Matthew 26:14-16, Mark 14:10-11, and Luke 22:1-6. Ominous music is playing in the background as we draw closer to the Last Supper. :) It is also the day the Scriptures note (Matthew 26:613, Mark 14:3-9, and John 12:1-19) that Jesus was in the home of Simon the leper, and anointed with expensive perfume by a woman who was also present. Lots of foreboding right there. As I was looking for information on Spy Wednesday, I read on several sites that this day is marked in Poland with a tradition of dragging a three dimensional representation of Judas through the streets. How is your Holy Week going dear reader? HB's class made this cute book for Holy Week. Each day has a short sentence about the day and an illustration using their hands, fingers, or feet. Spy Wednesday has a bag with several finger prints of coins. It's so cute!